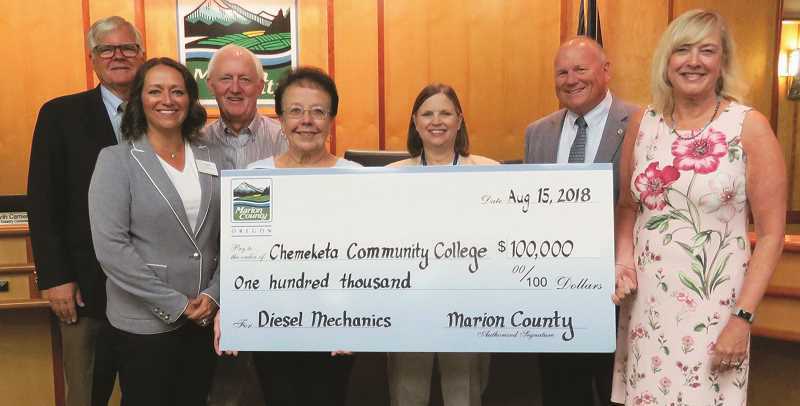 The Marion County board of commissioners have awarded a $100,000 grant to Chemeketa Community College to support its new Diesel Mechanics Program. This career technical program will serve a variety of businesses and employers within the transportation sector and will be located in Brooks.. Grant funds will be used for equipment and tools needed for students in the program. "We are very appreciative of Marion County's investment in our new Diesel Technology program," said Julie Huckestein, Chemeketa president. "This $100,000 grant will directly assist our program with much needed equipment and supplies." Students graduating from the two-year program will receive an Associate of Applied Science degree and be job ready in a field that pays a living wage and contributes to our region's economic vitality. Program participants will be trained to work on both agriculture and transportation equipment which will serve all parts of the Chemeketa district, in particular, the rural areas that have a harder time finding qualified technicians. "We are pleased to support Chemeketa Community College in this endeavor and are thankful for their continued partnership on this and other projects," Commissioner Kevin Cameron remarked on behalf of the Marion County Board of Commissioners. "Transportation is a state and regional priority. Chemeketa's planned Diesel Mechanics Program will be an important asset for our community. This grant is an investment in Marion County's economy and will help prepare students for long term, high paying career opportunities in both the trucking and large agricultural equipment industries."